JSF wrote: ... this is really quite an audacious move by GW, throwing out any pretext that this is a game and that its customers exist to do anything other than buy their overpriced products for the sake of it. The naked arrogance, greed and contempt for their audience is shocking. Wow, this caught me completely by surprise. I have been a ship without a rudder for about two years, WGF pulled out of retail and there was simply no way for me to continue production with them due to the delays. Popularity has a price and this industry is pretty intensive on sustainable and consistent releases... (not you but the retail side for the most part) and honestly making that all work from the margin standpoint is an up hill battle. But I have a course and destination I did not have even two weeks ago. The Shadokesh samples and the fact that they were quite good has allowed me to pull together all the knowledge I have gained so far, from a small time manufacturers standpoint and work up a plan to move forward.I was pushing this direction for a while but never happy with the move to resin... This, I hope, I think, will be a viable path. As I eluded to in the last post, I am working through the numbers trying to decide if an episodic production and release through Kickstarter is a viable option. So, we now have a course and a destination… Which honestly is a very welcome and refreshing change. As a marketing platform it allows to reach a wider audience, not just my current customers but those new to the hobby and those who never knew DreamForge was even a ‘thing’. I think we all know that the train has stalled, and its going to take a lot of effort and lots of attention to get it rolling again. Perhaps there will be a time that I can move off the Kickstarter platform, but for now… The broader exposure is required. This exposure comes at a price, Between the Kickstarter fees, the currency transaction fees and the backer support fees in the form of a post Kickstarter service to collect shipping and allow backers to add items or options, we are looking at near 10% in fees alone. Not every Kickstarter campaign will succeed, that’s OK. If the demand for a particular kit is not there, then its not… No harm no foul, we move on to the next product offering. I completely expect for there to be unfunded projects that never make it to plastic and possibly (if there was enough interest) may see a resin release instead. There will be changes to how DreamForge approaches on hand inventory and even they type of products offered, not all offerings need to be Iron Core specific, it provides far more flexibility in product development than making sure each product fits neatly into the project I have already started. If I get an itch to do…well anything, it gives a platform to see if all of you are also interested. How will that work? And what does that look like from the customers side? The plan is to have a very focused Kickstarter for a single product, its actual production costs and any profits expected will need to be folded into the funding goal. This is a strong departure from the retail model, where revenues are gained over time and the investment/debt is front loaded. Product availability outside the initial Kickstarter will be limited, 10% to 20% beyond the total needed to fulfill the Kickstarter will be run, some of that will be soaked up by the inevitable issues, damaged kits, mispacked or missing items from a kit and kits that never make it to the backer and get lost in transit. There may be re-runs offered on popular kits in future Kickstarter’s, but there will be minimums that need to be met, typically a 500 unit run will be needed. If I feel that the kit will sell, I may assist with purchasing some of that re-run myself, to provide stock on hand. The best way for a customer to approach this is to buy what you want and what you think you will need at the time of the offering, I cannot make a promise that there will be a second run if the overall interest is not there. Customers will need to pay for the actual shipping costs for the products they back. Shipping, as we all know is stuuupid expensive from the US to anywhere outside its borders. Each Kickstarter will be shipped directly from China to mitigate the expense to the customer as much as possible, this means most of the world will likely see a drastic cost reduction, but the US will see an increase. Why don’t I just ship the US from the US? Well, because it’s a hidden cost, one that would need to be calculated into the Kickstarter… Someone has to pay to get it to the US before it could be sent out from our warehouse, add to this the staffing costs, the shipping package costs and overhead, and it becomes a real issue that has not been factored into the per kit price… We are running as lean as possible, to provide a per kit price that is as low as possible, there will be no room for uncalculated expenses. How are the Kickstarters structured? This is open for revision, but the plan is to absorb the costs and required profits into a 1000 minimum unit run. If it costs $40,000 for the molds, production, boxes and services, then the cost of each unit would be $40.00. What happens if a Kickstarter goes nuts and the total funding far outstrips the required funding goal? Do you get a discount? Discounts will be offered when you pick up multiple kits, not by the overall success of a product. Those are profits that get re-invested to make DreamForge healthy, to pay for game development, to pay for additional stock, to help pay for re-release of the current line of kits, as those tools will need to be re-cut at some point. I am not pulling the discount off the table, but for the foreseeable future, I have a lot of catching up to do and core development that needs to happen for DreamForge to grow and thrive. I want to be clear, this is not going to be a song and dance Kickstarter model, there ‘may’ be extras offered if there is room on the sprues, ( I will try to pack them the best that I can) but anything extra in the form of products adds to the costs and I am not bulking the costs to deal with that. I am trying to keep the price per kit to you as low as I possibly can. Longer term with the releases and stock on hand. Obviously, this model does is not ideal for some aspects of brand development, limited supply concerns may not be ideal but it’s not unusual when we look around the industry and other companies that made their way on Kickstarter. I am not GW, I do not have their sales volume or the resources available to behave like GW. Please understand that expecting a small manufacture in plastic to be able to behave and function as one of the top two or three in the industry, may not really be a reasonable expectation. I will strive to get there, but until the financial aspect of that shift make sense, I will be doing what is best for the growth of the company with the resources available. I think we can all agree, that Iron Core needs at least two to three full factions, terrain and a rules set, so as we move through these requirements, I will try to weight when it becomes viable as its own free standing IP. The goal is to grow the brand, expand the product offering, make available some of the older kits and even start to offer some options for those not interested in Iron Core. Fantasy, Cyberpunk and a myriad of other avenues are available and the wider the base of offerings, the more stable the base. All of this is dependent on me, making what you want, delivered at a reasonable price within a reasonable time. I am very excited about the prospect and the future. I am really looking forward to exploring your ‘needful things’ and if they can be created and successfully funded in an episodic, backer driven environment. I hope that you join be on this new course and help guide my had in future releases. I will be reaching out in a few locations looking for honest feedback and direction from all of you. Through surveys sent to my mailing list… So please sign up on the DreamForge-Games website if you have not. Glad to see you’re going to put out more kits! I wish it could be a more traditional release model but I understand why you feel this is the best option. I hope you're pleasantly surprised by chinese shipping prices. I ordered a mini off of ebay in a deal that seemed to be too good to be true (hint: it was!) that was listed as in the US but it turned out to be shipping from china. The cost for shipping that with delivery confirmation across half the planet was less than it would have cost me to ship it down the street with USPS. Yep, the US was still a bit higher that what I can get price wise if it was local but overall not horrid. It works out much better for the rest of the world though and if I had to add in the shipping to me from China and then add USPS, China post still wins, even here in the US. Aliens are a hard sell, even harder without a game or proxy use. Shadokesh, may or may not be the first KS but I have no issue giving them a try, if they do not generate enough interest...So be it, I move to the next kit. As far as the Eisenkern matching, they never were meant to be GW clones and I really did not want to head down that path, the proportions that GW uses are not where I want to go. Could the Eisenkern have been a bit shorter? sure, but the bulk of a GW figure.. Nah, not for that line. If I made a set with an eye strictly as a proxy, then sure! but I would likely shoot more for the FW scaling, which is a bit less exaggerated. Mark, welcome back and all the best - will be watching for the Kickstarter(s) with eager anticipation! I'm super excited about those Shadowkesh test sprues. They look awesome! Also hoping to see the "Feral" Shadowkesh in plastic at some point. Wasn’t aware aliens were such a hard sell. Definitely didn’t want you to change your human’s proportions, I like the Eisenkern but I see how the difference in proportions might put some people off. I was thinking that it might not hurt to build brand recognition up with choices that are first and foremost for YOUR line but could have use outside it because they look fine next to GW etc. unlike the Eisenkern infantry vs. most 28mm figs. Goremaul wrote: I'm super excited about those Shadowkesh test sprues. They look awesome! Thank you and yeah, me too... I like the Ferals, they are something I would like to KS shortly after the Warriors... files are done and split and ready to tool. Padre wrote: Mark, welcome back and all the best - will be watching for the Kickstarter(s) with eager anticipation! I really appreciate you being so transparent about the plan / next steps . This has all been really interesting and informative! Exciting to know that you are back in action! It must be very hard to choose what models to develop if you are trying to expand your own setting while also catering to the larger 40k/general sci fi audience. I suppose that is what is good about ks, letting stuff fund on its own merit is a smart way to see what the market actually wants. I doubt the Shadowkesh would be nearly as popular as the Eisenkern (heck, 5 of the blogs I was reading featured those guys everywhere!) but they still look great and I would be happy to see them get some plastic kits as well. When in doubt, another human infantry kit would sell like hotcakes I'm sure. Given that the Eisenkern are essentially the Nazis of this game, some French Resistance guys, lightly armoured and more dishevelled would be a great addition. On a somewhat related note I just painted up some Mules, what awesome little models! If I could impose on a moment of your time? As you all know DreamForge is embarking on a new path, new releases in a new format. Although the Kickstarter platform has a lot of advantages, it only makes sense to put your best foot forward and provide your customers with the items they desire. To that end, I have created a very short survey to get all of your feedback, not just about the StuG and Shadokesh, but about DreamForge and the general direction you would like to see. Please... Take a moment and let your voice be heard. I do love the shadowkesh, and would probably get some just to have them. Maybe count them as Crusaders in my Astra Militarum army? But mine are renegades who associate with aliens, so that works. But yeah, it's hard to see those being as big a seller as the Eisenkern stormtroopers since I'm not sure how people would use them. Terrain might be a good seller. A lot of people can use more terrain. Or a second human faction as mentioned might be a bigger initial seller without having a game for them. Happy to help out - and filled out! I do think that 'scaling for the market' will help you out a lot, and that more affordable terrain is always a good thing too! Why waste limited resources on terrain when there are a hundred other companies putting out all manner of terrain already? Including GW. Seems like a waste for a small operation. There is a word for a wargamer with an empty paint bench. Terrain is cart before the horse - you create terrain to better evoke the world that you battle in. However, the artwork suggests that the typical warspace looks like a regular, industrial place that can use standard WW2 terrain. I guess Shadokesh terrain would be good. Especially if there are turrets or ambiguously vehicle-like bits. Answered the survey, thanks for giving us an opportunity to express our opinions. Strange, off-the-wall question; I love the keilerkopf transport, but I never seem to see its price reduced when you have a sale - is there a particular reason it doesn’t get discounted? There are a hundred other companies putting out infantry, to. And vehicles. Space Russians (sorry I can't remember the proper faction name) Using them as a lower-tech human faction. Large tracked tanks fulfilling the roll Leviathans usually do. Infantry and vehicles sell significantly better than terrain, that's the key difference. A quick thought on all this. People keep saying DF models should be able to be proxies in other games to help model sales. What if the opposite could be true as well? If there was an official Iron Core game the rules for factions could be made in such a way that players could cannibalize generic model kits and models from existing tabletop games (40k, Dust, AT-43, Warmachine, etc.) to fulfil rolls that don't yet have models in the game. People could then easily switch games (even if it's only to try it out) without too much investment. It's only a matter of time before they buy actual DF products. Heck, that's kind of how Games Workshop started out. Back in the day there were a handful of Marine and Eldar troops and you had to make due with converting up a WWII tank or some Zoids. 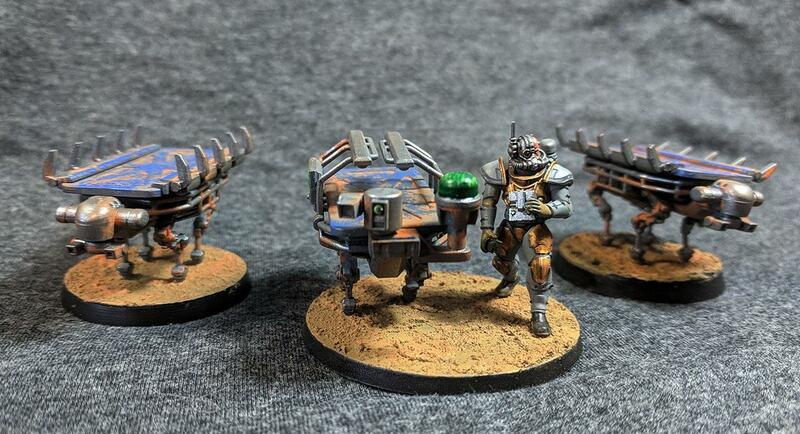 Writing a wargame specifically for using someone else's minis is a bad idea, because you are constantly chasing a moving target as new releases come out. If the DFG IC game is at a high level of abstraction ("elite heavy infantry"), rather than fine detail ("not-Terminator with paired not-Lightning Claws"), then it would be better. You'd make a big "count as" sheet like 40k3 had, although there are a lot more things in 8E+ than what 40k had back in 3E. And 3E had a lot more stuff than RT did. If I were responsible for the DFG IC game, I'd reskin KOG light for the core activity and resolution engine, and then tack on bonuses specific to the IC universe weapons and units. But really, there needs to be a vision for what it's like to sit down and play, whether it requires masses of models on a dedicated 4'x6' table, or whether it's something of a fancy skirmish that you play at the kitchen table. For any wargame I play I like the idea of scaleability. I'd like the "average" game to play on a 4x4 table, with the option of playing smaller games or larger games on smaller or larger tables. I'd like the average game to be the equivalent of 2 leviathans on each side. Of course, I mean each Leviathan being equal to 2 smaller vehicles, or 4 squads of elite infantry, or 6 squads of light infantry. So, a typical army may be: 1 Leviathan, a tank, one elite infantry, and three light infantry. Completed the survey, basically my feedback sums up my feelings on dreamforge "regardless of what you decide to do please consider my response to anything as shut up and take my money"